In honor of the fact that I screwed up my Monday post and it’s now Tuesday, I’m going to re-designate Tuesday as the New Monday. This will, I’m sure, cause confusion in certain parts of the world, so I’d appreciate your support during this tricky transition phase. Obviously, if today is Monday (which used to be Tuesday) that means yesterday was Sunday. Hence, if you worked yesterday (New Sunday as it will now be called), you worked on a day off and that should qualify as double overtime. Alternatively, if you forgot to work yesterday you can bask in the glory of a three-day weekend. Those of you who forgot to remember the future and plan ahead for the past will have write yesterday off to experience. There will be some other adjustments that are required. For example, if New Monday is actually Tuesday then New Friday will occur on Saturday, which means a late end to the working week. However, it was my fault we started late, and I don’t think we want to be late twice in one week, so for this first New Week, New Thursday (actually Friday) will be combined with New Friday, making the end of this week New ThurFriday. Don’t get used to this one, it’s a one-off deal. Likewise, Monday Night Football will have to become New Sunday Night Football. Negotiations are on going with advertisers that may extend the commercial breaks to the extent that New Sunday Night Football may actually last until New Monday night. Certain picky, picky government officials are hoping the increased advertising revenue might actually pay off their debts. Sorry, I mean, the national debit (how could I make such a mistake?). Naturally, Valentine’s Day will be renamed Valentine’s Eve. This means girls will have a bona fide excuse to write “I want chocolates and a night out” on the fridge door (preferably on an eye-line with the beer) and guys will get an unmistakable warning that they need to get their act together. A win-win all round. People born on February 29th will now have been born on March 1st. This means they will get a birthday party every year. On the downside, they’re now four times older than they were. Sorry about that. New Year’s Eve will become New Year’s Eve is Tomorrow, Stock Up On Cheap Champagne Day. Then the new, New Year’s Day will become New New Year’s Day and will be celebrated on the 2nd. Finally, Ascension Sunday was to become Ascension Saturday, but since this may cause problems with other parts of the religious calendar we’ll keep it as New Ascension Sunday (which will be held on Saturday) to avoid any Ascension tension. Well, I think that should do it. 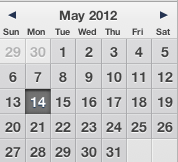 A whole “new” calendar based around my inability to click on the correct day for my blog to be published. Of course, if there are any “old-ists” of you out there that would like to argue for the preservation of their “old” days (Shrove Tuesday, for example), put forward an argument and we’ll discuss it tomorrow. Thank you for clarifying this. The old calendar was, frankly, getting a little stale. It was time to shake things up, and you’re just the person to do it. Since the feast days were originally in honor of martyrs, how about we kill two birds with one stone (so to speak) and combine them with Madame Weebles idea (see http://fearnoweebles.wordpress.com/2012/04/05/idiots-should-pay-more-taxes/). That way we could bump off the idiots who join the freeway at 30mph, who fumble for change after standing in line at the bus stop for an hour waiting for their bus, or who use the ATM as a great place to rearrange their handbag (because all those nice people in line won’t mind). We’d lose out on the tax revenue, but it might be worth it. That way we could have St Don’t Slow Down to Join the Freeway Day, St Get Your Bloody Change Ready While You’re Waiting Day, and of course, St Sort Your Handbag Out At Home Day. Granted, none of these are particularly beer-themed, but since when has that ever stopped people having a beer? If you really want a beer day, how about St Dogbolter’s Day, or perhaps St Bishops Finger Day. The whole martyr link may be a little difficult to establish, however. Now, I understand why my old Monday became my new Monday, and the day when a post should be up for me. ERK! A problem. My new Monday post is late. Which would you prefer? Name tomorrow the new, new Monday, or have me throw myself on my tiny Smurf knife and admit I’m late? Get back with me soonest. I have some heavy left-brained calculations to perform. I’d really hate for you to have an accident with anything smurf related. Monday will be Monday even when it’s not. So, eventually you’re going to have to face up to the fact that hey keep turning up, week after week after week. You do realize this will also play havoc with restaurants like TGI Friday’s and Ruby Tuesday’s, right? That being said, I agree with Diane, a new calendar is a refreshing change, and I very much like her suggestions about additional holidays. Can you make that happen? Also, can you change the official spelling of Sunday to Sundae? This way we’re basically obliged to have ice cream that day. A very good point about the restaurants, but I think TGI’s will be okay because they claim “it’s always Friday in here.” I think they’re living in a time warp, but they’re making plenty of money at it. Sundae sounds like an excellent idea on the ice cream front. Presumably, batter will become obligatory on Fryday (along with the fish). I’m working on the beer and feast days, but we can squeeze a few more in at least. This has been done before, by none less than old Scrooge McDuck! Or, to be fair, by his nephews. In the third season, second episode, “Allowance Day, ” the kids trick old Scrooge into believing it’s not Friday but Saturday instead, so they can get their weekly allowance in time to buy the bicycles that are on special sale until Friday. By midday Scrooge starts to turn his entire organization upside down since he hasn’t received the weekend status of his businesses that ‘Saturday’ morning as usual. Of course, for the rest of the world it’s still Friday, but since no one dares to confront the boss they all start working as if it’s really Saturday. Soon things start to get out of control. Having worldwide interests, McDuck Enterprises are bossing people everywhere to recoup the ‘lost’ day. From New York to Manila, businessmen (or should I say businesspets?) are going berserk working madly to please the Big Man (Big Duck?) while trying to understand how they all missed one full day of their lives! Tell me if you want to know how did this ended. After all, we could be all missing one day of our lives even before Mr. Blackwell decided to shift the entire year! Sorry for the delay, my PC crashed three weeks ago. As we remember, the kids tricked old McDuck into believing that Friday was Saturday and the joke went out of hand when half of the world believed it as well. The ruthless dictator in charge of the Republic Of Banana saw this as the chance to get his hands on the most profitable industry of his island, a McDuck owned fried-banana chips factory whose mortgage expired that same Saturday. Taking a rapid flight to the island, Scrooge McDuck tries to save his factory, but the contract is clear: the only way to avoid confiscation would be to have a time machine and travel just one day back in time. By this time, the three ducklings (is this the right term?) have no choice but to confess their wrongdoing. Fortunately for our heroes, the always resourceful Junior Woodchucks Guidebook gave them a hint: an astronomical phenomenon is the best way to date an event. And according to the astronomical calendar, a partial solar eclipse was about to happen ON THAT SAME FRIDAY (how convenient!) over the ocean, which will cause the sun to be seen as a banana right over the Republic Of Banana. Rushing to meet the dictator, the ducks confront him with the fact that if the upcoming eclipse happens, then it’s not Saturday yet but Friday instead; and he won’t be able to seize the factory. And just minutes later, the eclipse begins! Once again, the Junior Woodchucks Guidebook saves the day… er, week. As an epilogue, the next morning our clever ducklings convince Scrooge to pay them their weekly allowance as usual. But wait, he already did that yesterday! And yes, I’m still a fan of Ducktales! PC crashed? I was wondering why you’d gone quiet. That’s a “stella” story, especially the part about getting their allowance twice. Some kid oriented shows and movies have the very best plots because they don’t pad them out with fluff. Hi Derek. Sorry about the confusion over Pre-Tuesday, if I had known before I would have coordinated. As a possible compromise, could you perhaps refer to the start of the week as post-New Sunday? However, if I apply Einstein’s theories about time and relativity, I suppose you could be a day ahead. Hi Irene, good to see you. I have to admit I didn’t work all the timezone kinks out before I started. However, I’m going to depend on a variation on the Heisenberg principal, the more accurately you define the calendar, the less accurately you know the date. Therefore, as knowledge of my new calendar spreads around the world (in great detail, of course), the actual date will become less well know until everything lines up. I think another day should do it, maybe two if you’re on the other side of the date line. I hope you will have been having a good time, whenever it was. Sign me up for cheap champagne day, please. Ah, good point, Sherry. That’s a bit like the rationale that “I never drink before 3pm,” which has never been much of an obstacle for me since its aways 3pm somewhere. As for cheap champagne day, you’re in. I’ll drop you a reminder when it gets close. Nearly fell off my chair reading this post. Thanks, Nigel! I have updated my calendar accordingly. Fell off your chair reading this? Oh, right. You have one of those extra wide monitors 😉 Seriously, thanks, and I’m glad to hear you’ve updated your calendar, just don’t blame me if someone’s late with your birthday presents!